Grosse, W., Champavert, J., Gambhir, S., Wallace, G. G. & Moulton, S. E. (2013). Aqueous dispersions of reduced graphene oxide and multi wall carbon nanotubes for enhanced glucose oxidase bioelectrode performance. Carbon, 61 (September), 467-475. Aqueous dispersions of reduced graphene oxide (rGO) and multi walled carbon nanotubes (MWCNT) were fabricated through a modified chemical reduction method. The significant advantage of the method developed here is the omission of any stabilising compound or organic solvent to obtain stable rGO-MWCNT dispersions. Significantly biological entities, in this case the enzyme glucose oxidase (GOx), can be successfully incorporated into the dispersion. These dispersions were characterised using XPS, SEM, zeta potential and particle size measurements which showed that the dispersion stability is not sacrificed with the addition of GOx, and significantly, the electrical properties of the rGO and MWCNTs are maintained. 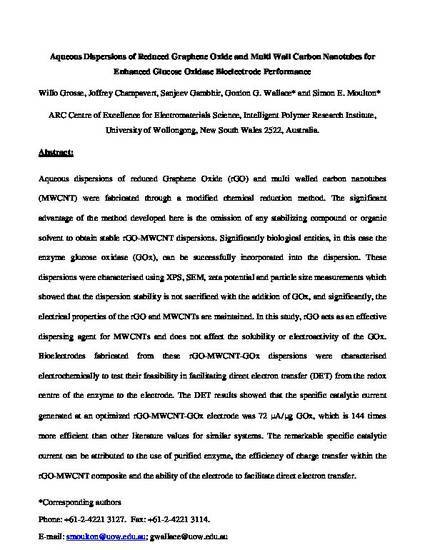 In this study, rGO acts as an effective dispersing agent for MWCNTs and does not affect the solubility or electroactivity of the GOx. Bioelectrodes fabricated from these rGO–MWCNT–GOx dispersions were characterised electrochemically to test their feasibility in facilitating direct electron transfer (DET) from the redox centre of the enzyme to the electrode. The DET results showed that the specific catalytic current generated at an optimised rGO–MWCNT–GOx electrode was 72 uA/ug which is 144 times more efficient than other literature values for similar systems. The remarkable specific catalytic current can be attributed to the use of purified enzyme, the efficiency of charge transfer within the rGO–MWCNT composite and the ability of the electrode to facilitate direct electron transfer.